Patriots, Redcoats & Spies: The Story Behind the Story ~ The History Girl! I heard that famous phrase often while growing up. Certainly, the general of the Continental Army slept in lots of places as he traveled the 13 colonies during the American Revolution. 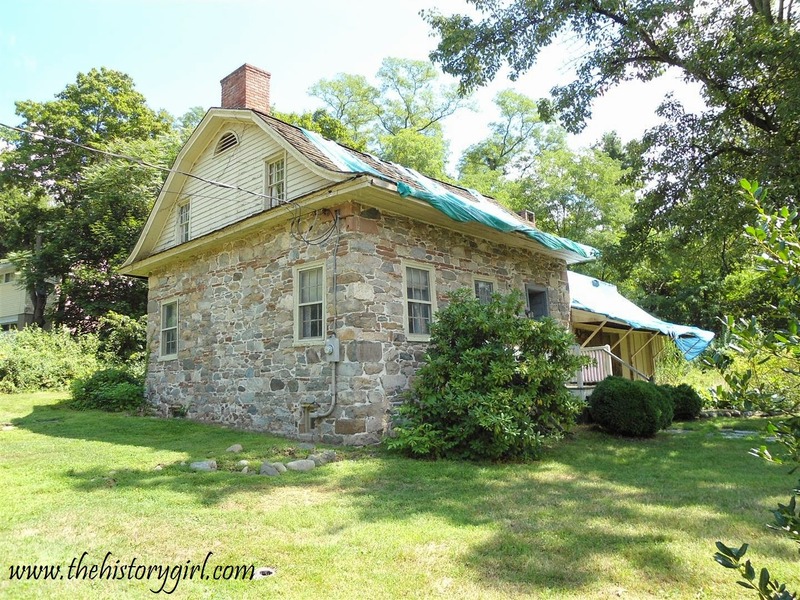 For two days—July 14 & 15 in 1777—he stayed at a home a few miles away from where I live. So, one, hot summer day, I decided to take the family to the Van Allen home, where Washington stayed, in Oakland, NJ, for a little morning trip. 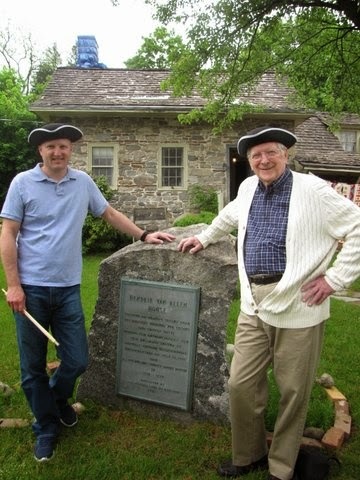 Robert J. Skead (left) and Robert A. Skead at the Van Allen House, Oakland, NJ. As I stepped out of my car and surveyed the property, I imagined George Washington walking those grounds more than 200 years ago. I could see his 6 foot, three-inch-frame majestically dismount his white horse and walk to the front door and greet the Dutchman who owned the home and surrounding land. I looked beyond the property toward the mountains and envisioned thousands of Continental Army soldiers, tired and hot, camped in the valley a few miles down the road. As I approached the front door, I imagined George Washington going through that exact doorway. This was George Washington after all—the courageous general who became our first President. He lived a life full of adventure and character. Once inside the Van Allen home my imagination sparked like a row of firing muskets. What did Washington do here? What did he say? What was happening in the Revolutionary War at that time? What was George Washington thinking? That last question was answered when I discovered the home, a historical landmark, sold copies of two letters Washington wrote while the home served as his “headquarters.” I bought a copy of each. The Van Allen House, Oakland, New Jersey. I suddenly imagined being a kid transported back in time to 1777 and going on an adventure with George Washington. I knew then I had a premise for a story. And with each step I took, I seemed to get more ideas about what could happen. Then, I walked outside and looked at the blue historical landmark sign that stood in front of the home. My mouth fell open. That day was July 14… George Washington was there the exact same day that I was 226 years ago. Not believing in coincidences, I thought that was cool. So we had a great morning at the Van Allen home and learned a lot - and I had a new story idea. Only I never wrote it. Year after year went by, and I still never wrote it. I wrote other stories but never that one. As the years passed, my father did our genealogy and discovered we had a relative who fought in the American Revolution in the Connecticut militia and Continental Army. We joined the Sons of the American Revolution organization, and received membership certificates. It was neat to think we had a relative who played a role in securing liberty for our nation. Three days later, I received an email from my father, who was already in his 80s. The email had an entire treatment for a story—beginning, middle and end. My dad had taken my premise and ran with it. 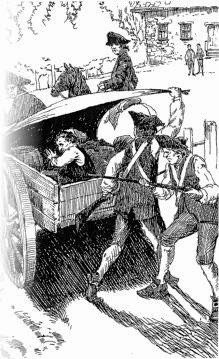 An image from Patriots, Redcoats & Spies. As I read it, my heart beat faster. It was really good. How did this happen? My dad wasn't a writer. He certainly read a lot (which always makes people better writers), but he had never written a story before. So, for fun, that night, I took 20 minutes and wrote the first scene and emailed it to him. He wrote back and said it was great and encouraged me to keep going. Of course, I put my own spin on his ideas and added things that were needed. His treatment didn’t have any dialogue. But it did have momentum, and what characters might be thinking and what was going on in the war, and where the characters might be heading. My dad loved seeing the story come to life and as the story progressed, we improved it together. After many weeks, it was done. At least the first draft (there would be about 10 more). My dad’s encouragement and enthusiasm kept me going, and it was the most fun I ever had writing a story because I did it with my dad. What a blessing. Why did I never write the story, years ago, after it first hit me, like I usually do? Looking back, all I can say is that it was meant to be that I wrote this story with my dad. To me, this “story behind the story” is just as special as Patriots, Redcoats & Spies. Growing up in Wyckoff, NJ, Robert J. Skead didn't always like reading books but immediately excelled in creative writing. When Robert J. Skead was 25 and first considering a career as a writer, his father, Robert A. Skead, wished he wouldn't (instead Robert A. wanted him to get his MBA). When his father began to read some of his first stories however, he became one of his son’s biggest fans. 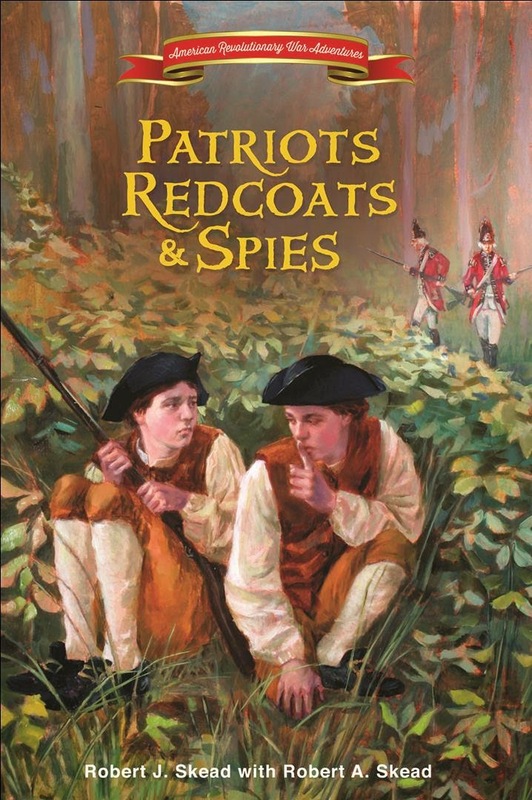 Fast forward 15 years after Robert J. Skead was first published, the father-son pair wrote a book together, Patriots, Redcoats and Spies. Robert is also the author of a number of children’s books, such as Safe At Home - A Baseball Card Mystery and Elves Can't Dunk.